Onyx from Titanium Software aids Mac users by providing a simple method to access hidden system functions, run maintenance scripts, automate repetitive system tasks, and access many of the secret parameters that can enable and disable hidden features. 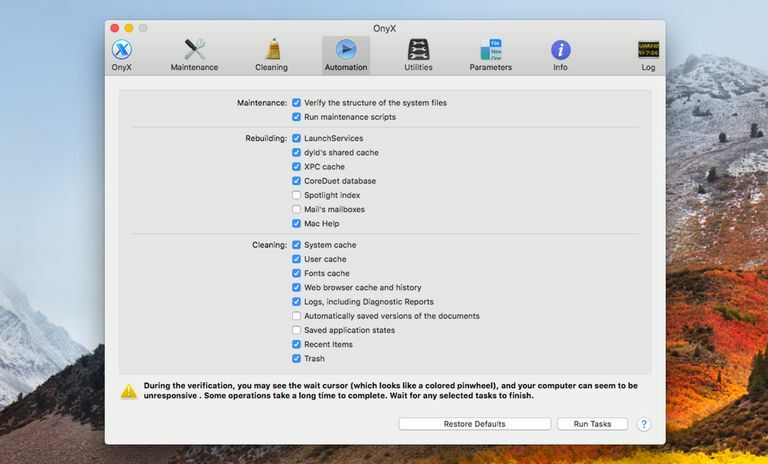 Onyx is a free application that has been performing these services for the Mac ever since OS X Jaguar (10.2) first appeared. The developer recently released a new version specifically for macOS Sierra and macOS High Sierra. Onyx is designed for specific versions of the Mac OS. Make sure you download the correct one for the version of OS X or macOS you use on your Mac. When you first run Onyx, it wants to verify the structure of your Mac's startup disk, which is not a bad thing to do. It won’t cause any problems on its own, but it does force you to wait a bit before you start using Onyx. You don’t need to do this every time you want to use Onyx; you can simply cancel the verify option. If you find a need to verify your startup drive at a later date, you can do so from within Onyx, or use Disk Utility to perform the verification. An ongoing theme in Onyx, as well as many of Onyx's competitors, is that the functions available in this utility are present in other apps or system services. Onyx's real service to the end user is bringing them all together in one app. After you move past the startup drive verification, you'll find that Onyx is a single-window app with a toolbar across the top for selecting various Onyx functions. The toolbar contains buttons for Maintenance, Cleaning, Automation, Utilities, Parameters, Info, and Logs. Info and Logs are somewhat basic functions. Most people don't use them more than a few times when they're first exploring the app. Info provides information equivalent to the "About This Mac" Apple Menu item. It goes a few steps further by giving you easy access to the list of malware that Mac's built-in malware detection system is able to protect your Mac from. It doesn't provide information detailing whether the system ever caught any malware being downloaded or installed — only the list of malware types your Mac is protected from. Still, it's handy to know what your Mac is protected from and when the last update to the protection system was performed. The Log button brings up a time-based log showing every action performed by Onyx. The Maintenance button provides access to common system maintenance tasks, such as verifying Mac's startup drive, running maintenance scripts, rebuilding services and cache files, and repairing file permissions. Permissions repair used to be a standard troubleshooting tool with OS X, but with OS X El Capitan, Apple removed the permissions repair service from Disk Utility as being a service no longer needed. The file permissions repair feature in Onyx works just like the old Disk Utility permissions repair system worked. It may not be needed because Apple started protecting system file permissions in El Capitan and later, but it doesn't seem to have any detrimental effect. The Cleaning button allows you to delete system cache files, which can sometimes become corrupt or unusually large. Either issue can cause problems with your Mac's performance. Removing cache files can sometimes correct problems, such as a spinning pinwheel of death and other minor annoyances. Cleaning also provides a way to remove large log files and erase trash or specific files securely. Automation is a handy feature that lets you automate routine tasks you may use Onyx for. For example, if you always verify the startup drive, repair permissions, and rebuild the LaunchServices database, you can use Automation to perform those tasks for you instead of performing them one at a time. You can’t create multiple automation tasks, just a single one containing all the tasks you want to have executed together. Onyx provides access to many of the hidden apps that are already present on your Mac, just stashed away within the recesses of the system folder. You can access the Terminal's manual pages without having to open the Terminal app, change file and disk visibility, and generate checksums for a file, which is helpful when sending files to others. You can access hidden Mac apps, such as Screen Sharing, Wireless Diagnostics, Color Picker, and more. The Parameters button gives you access to many of the hidden features of the system as well as individual apps. Some of the features you can control are already present in the system preferences, such as showing graphics effects when opening a window. Others are parameters you usually need Terminal to set, such as the graphics format used to capture screenshots. For those of you who like to hack the Dock, there are some interesting options, including having the Dock only show icons for active apps. The Parameters button is probably the most fun part of Onyx, as it gives you control over many of the GUI elements of your Mac, letting you alter the look of the Mac and personalize the interface. Onyx sometimes gets a bum rap from advanced Mac users who complain it can cause problems by deleting files or turning off features that are needed. The other frequent complaint is that Onyx doesn't do anything you can’t already do with Terminal or other apps already present on your Mac. There's nothing wrong with using a utility such as Onyx to perform a task usually performed in Terminal. Terminal requires you to remember complex command lines that, if entered incorrectly, can either fail to work or perform some task you didn't mean to happen. Onyx removes both the barrier of remembering commands and the unfortunate side effects possible by executing a command incorrectly. Onyx provides easy access to many key system features and services. It also provides some basic troubleshooting services that can help you get your Mac working again or provide increased performance. All in all, Onyx is a useful tool.